In addition to playing right-sized tennis with modified racquets, balls and courts, kids in Colorado will soon track their own points from earning “stars” and “trophies” as they progress through the 10 and Under Youth Tennis Tournament Pathway. Beginning in January 2018, Colorado and the Intermountain Section will implement the national Youth Progression Pathway that is currently being used across the country. Parents of players 7-10 years old throughout the Intermountain Section — Colorado, Idaho, Montana, Nevada, Utah and Wyoming — will find it easier to navigate the waters of youth tennis beginning in 2018, as the Section will adopt the USTA's National Youth Progression Pathway. All 7-10 year old divisions in Colorado tournaments and Junior Team Tennis will be "gamified" by adding online tracking game-play elements to engage players on the youth tennis progression pathway. In addition to playing right-sized tennis with modified racquets, balls and courts, kids in Colorado will track their own points from earning “stars” and “trophies” as they progress through the 10 and Under Youth Tennis Tournament Pathway. 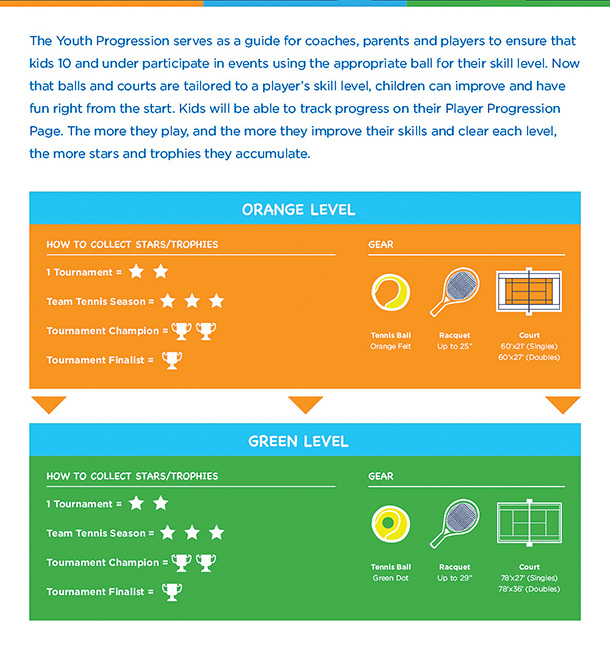 USTA has designed a best-in-class system to track the progress of junior players, ages 7-10, from Orange Ball to Green Ball and Green Ball to Yellow Ball. The system will track a player’s progress through Sanctioned Tournaments and Junior Team Tennis, where players earn participation points/credits (STARS). Players earn achievement credits (TROPHIES) at select tournaments if they reach the finals, and additional points if they win the tournament. The mission is to clear each level (ORANGE then GREEN) by collecting a combination of 20 stars and/or trophies. Players can track their progress on their unique Player Profile Page. The more they play, and the more they improve their skills, the more stars and trophies they accumulate. The way the system is designed, every child develops at his or her own rate, therefore there is no specific timeline for moving along the pathway.